The Heritage Quay collections are full of examples of literature of all genres. The Ted Hughes Network archive and Donald Crossley explore the life and career of the Yorkshire-born poet. A smaller complement is the Adrian Mealing Ian McMillan memorabilia collection. 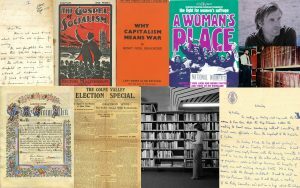 Creative writing can also be found across many of our collections, from lurid true crime writing to lyrics, sermons, children’s stories, newspapers, autobiographies and political and radical publications.